Based on the selection available, making an original board game based on events from the Bible is tough. Making a good game based on events from the Bible? Even tougher. Lance Hill is currently seeking funds on Kickstarter for his new board game project, Kings of Israel. He has already passed his funding goal with almost two weeks left to go. We had a chance to interview him about his game. Briefly, what is Kings of Israel? Kings of Israel is a Bible-themed board game taking place about 3,000 years ago during the reign of kings in Israel. Each player takes on the role of a line of prophets that, as a team, is trying to keep evil in check within Israel while building the altars needed to win the game. How does Kings of Israel play? There are four phases to each round in Kings of Israel. The round starts off with a good or bad event, depending on whether the king leading Israel that round is good or bad. Most are bad! Then evil spreads in Israel–some of it is internal, some of it is from outside nations. Evil takes on the form of sin cubes and idols in Kings of Israel. If enough sin cubes pile up in one location then an idol is built. If evil increases at an idol, then sin spreads from that location. Next, each player takes their turn using their four actions. The actions can be used to do a few things. The player can acquire resources, which are used to build altars and make sacrifices. The team may remove evil by destroying idols, removing sin cubes, or making sacrifices which remove large amounts of sin cubes from one region. Additionally, players may give each other resources if at the same location. If playing the Expert version of Kings of Israel, after each player takes their turn, a false prophet also gets a turn trying to spread evil and destroy altars. Finally, the round ends with the timeline token moving down to the next king chronologically, the starting player changing, and in the Easy version the players also get to draw a Blessing card if they made a sacrifice that turn. Players win the game if they build the required altars, while they lose if they run our of sin cubes or idols, or if the timeline token reaches the bottom and Assyria destroys Israel. That is the basic summary of a turn in Kings of Israel! Strategically, winning in Kings of Israel requires knowing when to acquire resources and build altars and when to just remove sin cubes and idols and survive the round. If players push too hard early on to build altars, they can become quickly overwhelmed by the sin cubes and idols they neglected. On the other hand if they neglect building altars then the team might later not have what they need to make sacrifices or run out of time to build all of the altars before Assyria destroys Israel. There is also a bit of push-your-luck in Kings of Israel, especially when it comes to making sacrifices in the game. A sacrifice can remove large amounts of sin cubes and save a ton of actions, but first an altar needs to be at the player’s location, and secondly Grain and Cattle resources are needed to make that sacrifice. So in dangerous areas oftentimes there is a situation where a player must decide whether to try to draw that needed Grain card to make a sacrifice or to just go ahead and remove the sin cubes by hand and not risk the chance of idols appearing. Teamwork is very important, and if a player fails to do what they needed to do then there better be another player ready to cover for them. Why did you choose to set your game during Israel’s divided kingdom period? What drew you to the northern kingdom setting in particular? What developmental work or research did you do to fit this setting?If I remember correctly, I initially chose this period of time because I wanted to have Israel at its largest to have a lot of locations to visit. When I started to think about using kings as a timeline and an event determination device, it just seemed to fit. And I chose the Northern Kingdom over Judah for a couple reasons. First of all, the locations and routes in the Northern Kingdom work much better for a board game than Judah. There are more known locations to work with, and the locations were more interconnected it seems. Secondly, I wanted a lot of bad events weighing down the players, and I needed bad kings for that. Israel won that battle pretty easily! When designing the game I spent a lot of time in 1 and 2 Kings in the Bible, and I referenced The New Moody Atlas of the Bible heavily for possible locations to use and for the trade route maps that it contained. You’ve mentioned that you developed Kings of Israel to combat a deficiency in other religious-themed games. 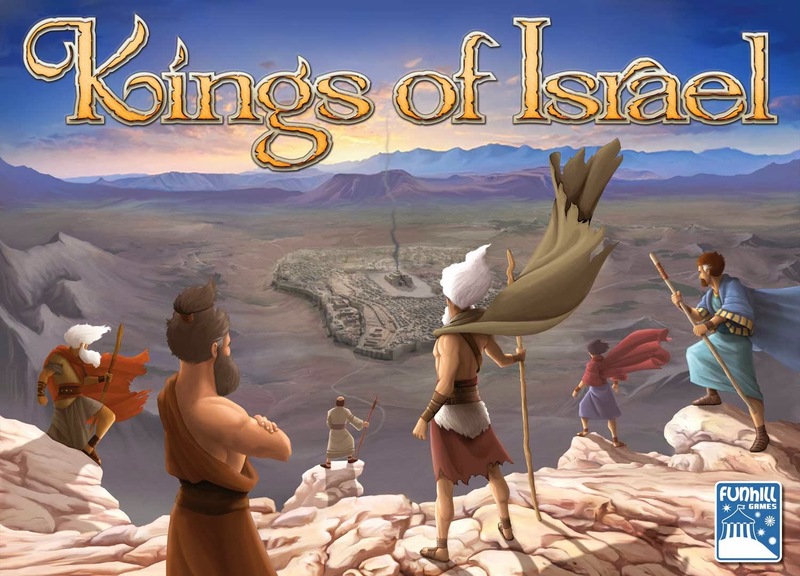 Why do you think these other games fell short, and what does Kings of Israel offer instead? I believe that religious-themed games too often try to do a copy and paste version of mainstream games, instead of trying to build a game that stands on their own. A Bible-themed Apples to Apples game might be still enjoyable, but it will very likely be a lesser game because it instantly reduces the number of card options in the game and prevents any chance of playing it with non-believers. It won’t be any more thematic than the previous version, there are no new decisions to be made, so there is no real purpose to make that kind of retheme except for marketability. The Bible-themed games that do try to stand up on their own might provide the theme needed but then use mechanics that are not fun (roll-and-move). Others might make a game with enjoyment but with no real theme to the game. The only thing thematic about the game would be the title. There are problems when designing Bible-themed board games that I think prevent more good games from coming out. The biggest problem I see is that good games need decisions, and decisions mean different results, but the stories in the Bible cannot have different results, so it instantly limits options. Regardless, Bible-themed games still need to stand up on their own, and I believe Kings of Israel does that. The final result in the game will still be Israel getting destroyed by Assyria, but there is a goal that can be achieved before that moment, and there lies the enjoyment in Kings of Israel. The theme fits very well, there are many decisions within the game that are unique to Kings of Israel, and the game is fun. Do you have any other games in the works? I have a couple ideas I am working on. The one that it getting to the playtest stage is a game about building prefab houses called “Prefabulous.” I am also fleshing out a game based on the journeys of Paul that I might start working on heavily if Kings of Israel proves that there is demand for more strategic biblical games. So far that seems to be the case! Is there anywhere you would like to direct our readers? I would also direct them to the Board Game Geek page for Kings of Israel, since I have been asking for feedback on map changes and other things there. Also, I am auctioning off a prototype copy of Kings of Israel for the Jack Vasel Memorial Fund. I would recommend everyone to check out that geeklist to help support a good cause. This is the Kings of Israel entry. A big thank-you to Lance for taking the time to talk to us about Kings of Israel. Kings of Israel is currently available for funding on Kickstarter. Check it out here.